Hello Readers! I am still recovering from Thanksgiving and don't think I can eat anymore turkey, pie or nuts for a while (should be good by Christmas). 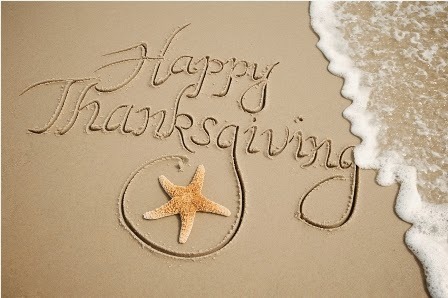 We had a very nice Thanksgiving and the food came out perfect. I've been off since Wednesday and have not read a thing in all that time. I've been watching an abundance of Law and Order and What Not to Wear episodes instead. 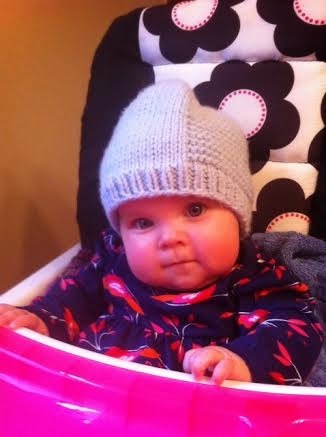 I feel like I've lost my blogging and book reviewing mojo, while I think about what the next (3.5) weeks will be like. It's always an excess of food in my circles. We have several holiday functions --work related, an annual fancy Sunday brunch with Santa to celebrate my birthday in December and then there is Christmas Eve and Day and New Year's eve and day as well. Is your next few weeks "food fests" as well. How do you cope, or do you just indulge and address the weight gain on January 2nd? 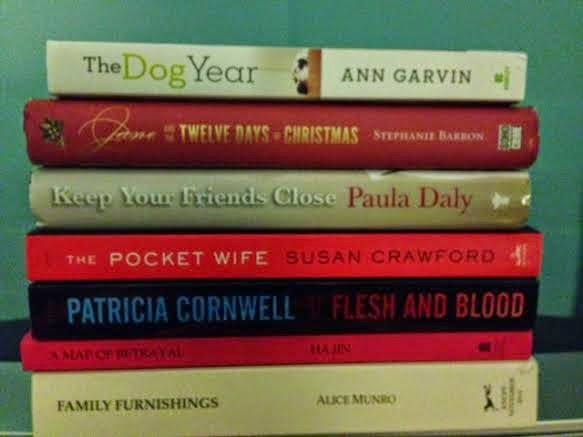 I have completed a few books that I enjoyed, but have not reviewed them yet. 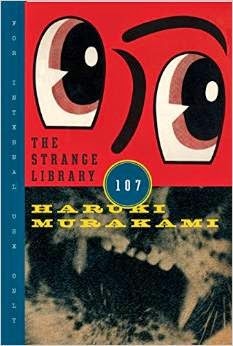 One was Florence Gordon, by Brian Morton and the other is the new book by Haruki Murakami, The Strange Library....very bizarre and more like the old Murakami (this one less than 100 pages). 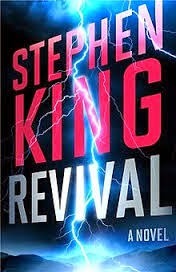 I hope to begin Stephen King's, Revival next. 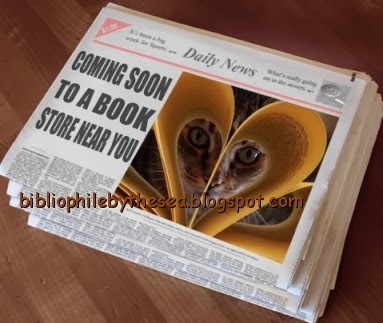 Quick trip to grocery store, make a pot of soup for lunches this week and maybe a little reading. 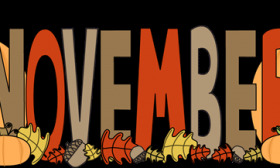 Today I will be hosting Thanksgiving for my children and grandchildren (2.5 years, 7 months and almost 5 months) . It is also my son's birthday. We all certainly have much to be thankful for. 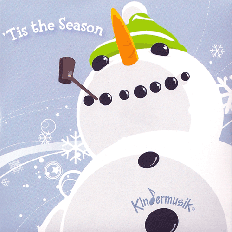 Wishing you and yours a special day. 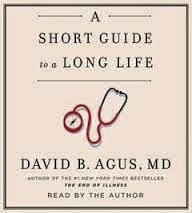 A Short Guide to a Long Life; David B. Agus, M.D. A Short Guide to a Long Life was a quick and easy book to listen to. The format was easy to follow and the information interesting, although a good portion was things we've heard before read before. The doctor believes in a set of rules (65) to be exact, for living wisely. He believes that by following this rules we could minimize our risk for cancer, heart issues and strokes. Dr. Agus considers himself to be conservative in his beliefs. The book is divided into three sections: (1) What to Do, (2) What to Avoid, and (3) Doctor’s Orders. In the first section: What to Do, he recommends knowing your body, and monitoring your vital signs, sleep patterns, what you eat, times you feel lousy and times you feel great. He has a rule about "Eating Real Food and Don't Let the Apple Fall Far From the Tree". Eat fresh vegetables and fruit that are in season, not ones that are transported from foreign countries. He points out that by the time such produce reaches us, it has lost much of it's nutritional value. He also recommends having a glass of wine with dinner, getting a flu shot, good hygiene, getting into a caffeine habit, knowing the health issues our grandparents dealt with, taking baby aspirin, taking statins if you are "over the hill (40+), never skipping breakfast, pursuing your passions and having children! People who have children are more likely to live longer and take better care of themselves according to Dr. Agus. He also recommends avoiding: processed foods, fad diets, juicing, vitamins and supplements, airport scanners (ask for a pat down), detoxes, insomnia, sunburns and more. I found Part (3) of the book, Doctor's Orders, a bit annoying. It covers things you should have checked by your physician and various screenings for age groups: 20's, 30's, 40's, 50's, 60's and 70's. It's very basic info most of us know and it's repeated again by age group tacking on a few extra tests as we age. A few more pieces of interesting info for me was: 1951 was the last year "old age" could be used as a reason for death on US death certificates. Top (3) causes of death in the US are: Heart Disease, Cancer and Chronic Respiratory Disease, while world wide the top (3) causes of death are: Heart, Stroke, Lower Respiratory Disease (Cancer is #7). Overall, I'd say that I mostly enjoyed this one. Fifteen year old Jam Gallahue has not been able to bounce back from the death of her boyfriend, British exchange student Reeve Maxfield. Although the two only knew each other 41 days, Jam has been inconsolable. Her parents decide to send her to The Wooden Barn, a private boarding school for emotionally troubled teens in rural Vermont. It's part hospital and part school setting, and known for treating depression and other psychological issues. At The Wooden Barn, Jam is selected to be part of a special English class that studies the life and work of Sylvia Plath. A requirement of the class is that each of the five student in the class read Plath's novel, "The Bell Jar". In addition, they must do some journaling twice a week in an antique journal they are given. 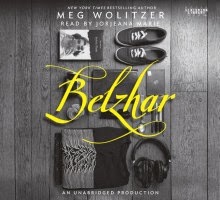 Through this assignment each individual is transported to a time in the past, a place they call "Belzhar, a word play on Plath's well known work, "The Bell Jar." It is through this assignment that each student begins to deal with their own personal situation that and the reason they ended up at The Wooden Barn. I initially rolled my eyes when I thought about Jam becoming so unraveled emotionally over a boy she had known just over a month, but as I let myself suspend belief and go with the flow. I gradually began to enjoy the story. I liked how the teens bonded with one another as part of this exercise, by getting to the root of their personal traumas. I do wish the characters were developed a bit more, and thought that the ending was wrapped up a bit too neatly. Despite this I think readers, especially ones drawn to YA novels, will be happy they tried this one. "In the dream house, the boy listened for the monster under his bed. An awful presence in the dark had awakened him in the dead hours, and he waited for the telltale sound of breathing. Would there be breathing? Or would it arrive in silence, without warning? He would have no time to defend himself or save the treasures hidden in his old toy box. The possibility of such an attack unnerved him, but he dared not move. He did not dare lean his head over the side of his boat to check the space between the mattress and the wide blue sea of the braided sisal rug. He did not dare turn on the lamp and flood the room with light and risk spooking the monster from its hiding place. There was no breathing but his own, no sound at all but the thrum of his heart." 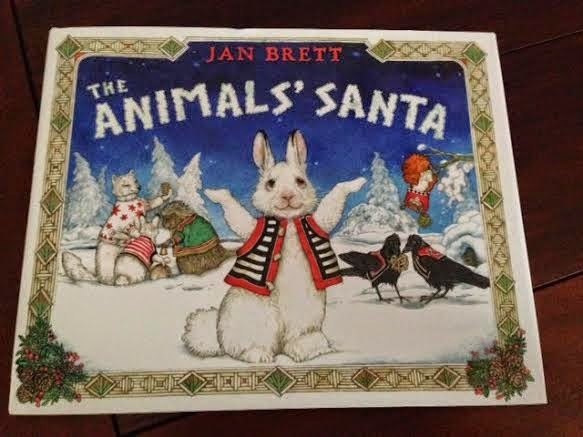 I was so excited to see that Jan Brett had a new holiday book out for children this fall. She is such a talented author/illustrator. This book looked so cute, I even pre-ordered it. 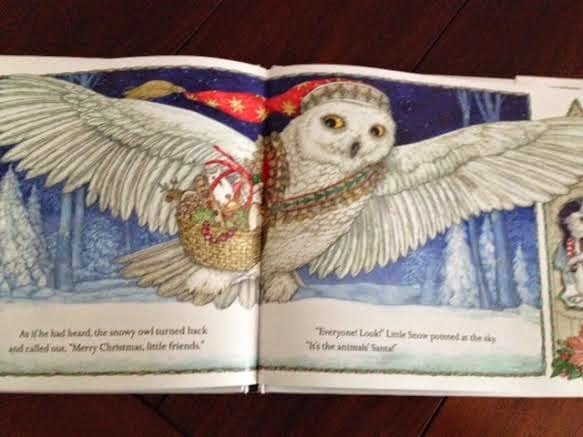 In this story it's the first Christmas Eve for "Little Snow", and his older brother, "Big Snowshoe" tells him that the "Animal's Santa" comes tonight. He tells Little Snow that none of the other animals know who the Santa is but in the morning they always find presents like, a bell, a puzzle toy, a heart-shaped wishing stone or even a stack of acorns. 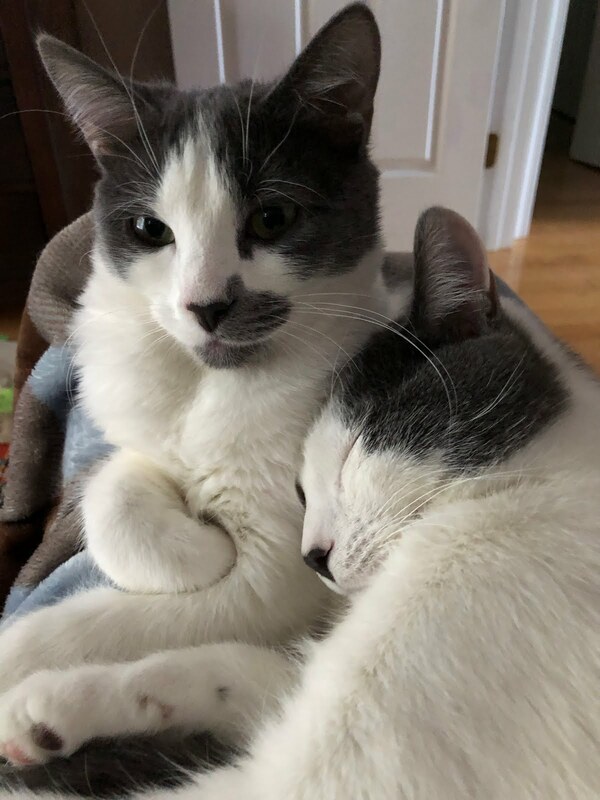 Little Snow finds this hard to believe and thinks his big brother is fooling him. 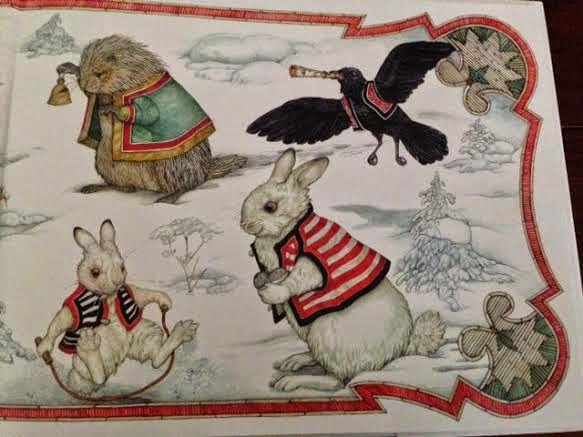 As the story continues, each animal tries to imagine who Santa might be. It's now time to snuggle into their dens for the night and she what happens in the morning......No footprints in the snow? Who could Santa be? Look up above and gifts begin to fall from the sky, with a special wish from a special Santa wishing all a very Merry Christmas. The story is special, the beautiful illustrations pure delight and each panel engages the little ones as the other animals tell about Christmas past. A keeper for your personal collection. Children and adults will love this one. 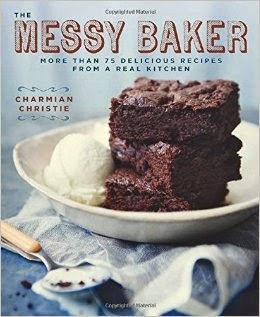 The title, The Messy Baker, got my attention especially since I love to bake, but make a huge mess in the process. Comprised of some 75 recipes, almost every recipe has a beautiful gloss photo to show you what the finished product will look like. I was surprised by the fact the recipes are not all desserts, as somehow the title and cover lead me to believe, but that's okay, I liked the variety of recipes. Yes, there are muffins, cookies, tortes, scones, tarts etc, but you'll also find some recipes for things like pizza, waffles, cauliflower, fritters and more. The recipes contained are not your standard run of the mill recipes that you tend to find again and again, but each recipe seems to be a new twist on a recipe that I wouldn't have thought of in this new way. The chapters have fun titles like: pastry; crumbly; dippable; sloppy; smudgy; gritty and drippy. The book is more about how the final product tastes, and judging with your mouth and not eyes, rather than obsessing about whether your final product is "picture perfect". Here's my "Coming Soon to a Book Store Near You" pick for today. Do you plan on trying this one? It's a short novel (just 96 pages) compared to the author's previous books. 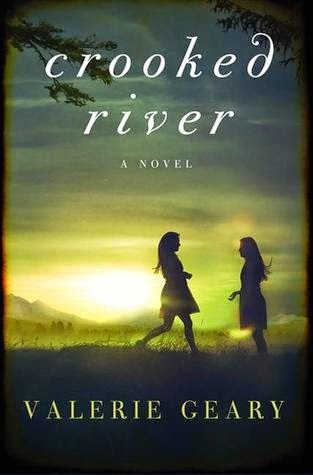 Crooked River tells the troubled tale of sisters Sam, 15 and Ollie, 10. 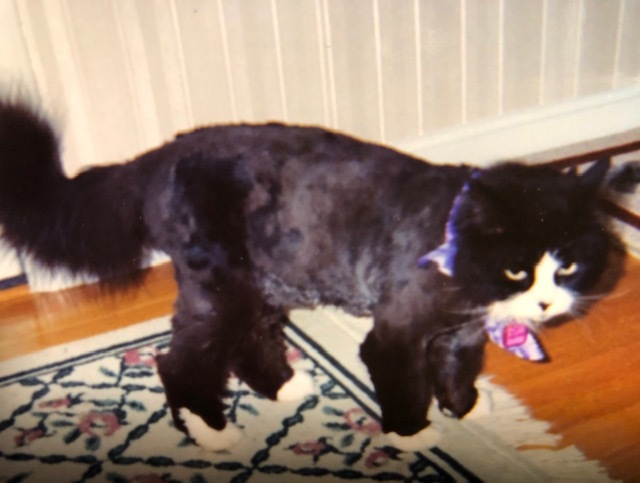 There mom died recently and they are hoping to stay living in Oregon with their father Frank, "Bear", McAllister and his very unconventional way of life. Bear lives in a teepee and the money he earns comes from raising bees and selling the honey. The girls love their dad and like being with him, and their grandparents in Boston have agreed to a trial period to see how things work out for the girls living with their dad. Soon evidence mounts against "Bear", who is seen as an outsider in the small rural community. Bear is arrested, but the sisters are determined to prove their dad is innocent. They begin some amateur detective work on their dad's behalf. As the investigation begins, ghosts speak to Ollie, a girl so traumatized by her mother's death that she refuses to speak. When she does speak, others do not believe her. 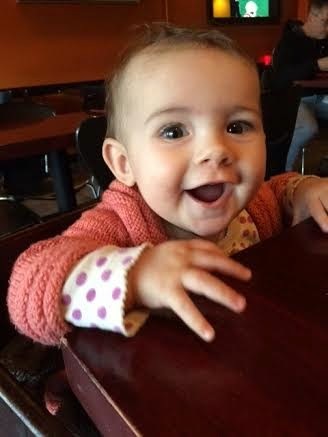 Her sister calls her a baby and does not believe spirits exist. Narrated in short alternating chapters by Sam and Ollie, I enjoyed this coming of age mystery of sorts. I admired the sisters devotion to their father. The girls got themselves into some sticky situations, but because of their ages, it seemed both foolish and yet plausible. The characters well developed and I also liked the older couple who watched out for the girls. 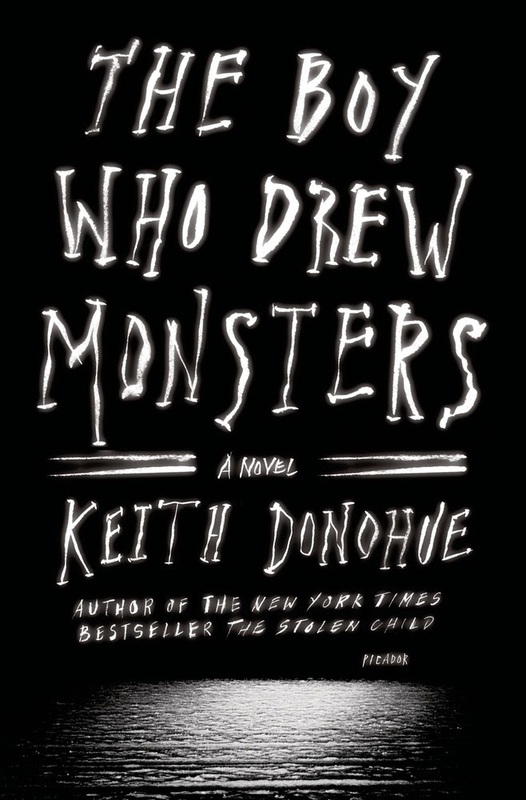 Overall, a very good debut novel. 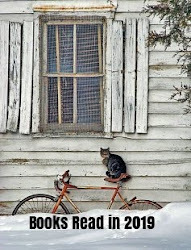 I typically enjoy an occasional dose of easy, breezy holiday books, especially those with great setting. Winter Street, by Elin Hilderbrand seemed to fit the bill. In this story, set on Nantucket Island, the Winter Street Inn is preparing to host their annual Christmas party. Unfortunately the Inn owner Kelly Quinn has just found his second wife Mitzi kissing Santa Claus, and to make matters worst, Kelley learns it just wasn't a spirit of the holiday kiss, but that his wife and the man whose been playing Santa year after year have been carrying on for years. The rest of the Quinn family has issues as well, and for this family it looks like it will be a "Christmas to forget, rather than one to be remembered." I had a hard time with this one and really didn't care about any of the Quinn family characters and their tales of woe. To me, the story seemed too contrived and poorly executed. Fortunately it wasn't a long story, but it was a disappointing one. "In one way, at least our lives really are like movies. The main cast consists of your family and friends. The supporting cast is made up of neighbors, co-workers, teachers, and daily acquaintances. There are also bit players: the supermarket checkout girl with the pretty smile, the friendly bartender at the local watering hole, the guys you work out with at the gym three days a week. And there are thousands of extras--those people who flow through every life like water through a sieve, seen once and never again. The teenager browsing graphic novels at Barnes & Noble, the one you had to slip past (murmuring "Excuse me") in order to get to the magazines. The woman in the next lane at a stoplight, taking a moment to freshen her lipstick. The mother wiping ice cream off her toddler's face in a rode side restaurant where you stopped for a quick bite. The vendor who sold you a bag of peanuts at a baseball game." 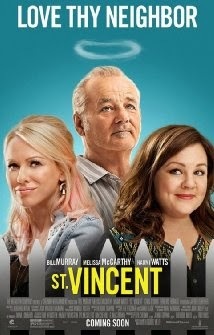 St. Vincent -- Touted as a comedy, this was one movie that yes, made us laugh, but also had us searching for tissues as the emotional tears flowed as well. Bill Murray is "Vincent" a grumpy, Vietnam Vet who drinks too much and gambles too much. 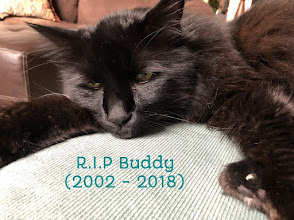 He lives with his cat in Brooklyn, and has no money, and little prospect for happy senior years. New neighbor, Maggie, (Melissa McCarthy) and her young son Oliver (Jaeden Liberher) move in next door. The newly divorced, mom works long hours at the hospital, and Vincent volunteers to watch Oliver after school for a fee. While Vincent teaches Oliver how to toughen up, and takes him to places most kids have never seen, Oliver begins to see the kinder, caring side of Vincent that others do not see. Do yourself a favor and be sure to see this movie, sometime soon. I hope you will love it as much as we did. This is one of those movies where the theater sat silent and no one left until the screen went dark. 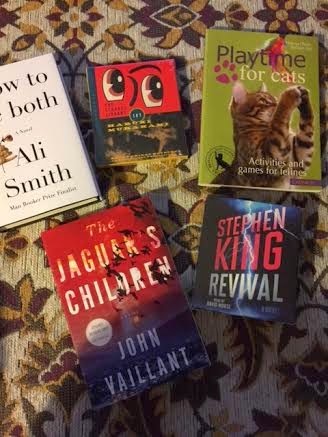 I was so excited to get this wonderful, season appropriate, selection of kids books in the mail this week. The messages and illustrations are all lovely. 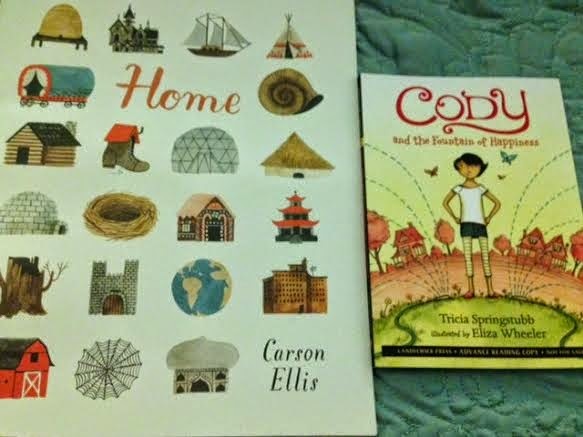 Thank you to the great people at Candlewick Press for sending these beautiful books my way. Here is a quick overview for each. How can a young boy ever show his gratitude for all the beauty he sees? He will learn from his father, who thanks the earth and the sky, the frogs and the crickets, the hawk and the deer, even the trees that wave their arms in the breeze. Majestic as the most beautiful autumn day and filled with glimpses of favorite woodland animals, GIVING THANKS is truly a gift to readers from nature-lover Jonathan London and master painter Gregory Manchess. What's So Yummy? 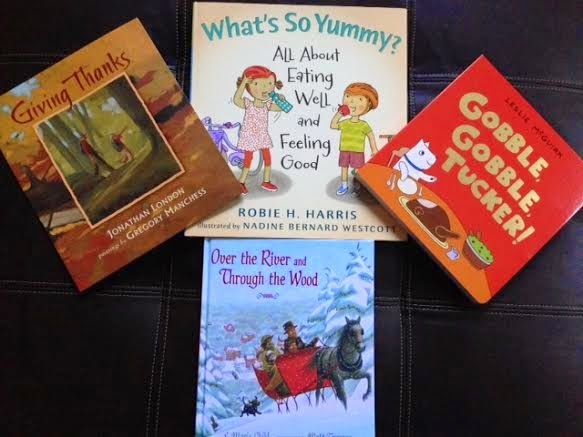 All About Eating Well and Feeling Good; Robie Harris (description) - Acclaimed New York Times best-selling author Robie H. Harris introduces preschoolers to the pleasures of eating healthy, being active, and feeling good. Gus, Nellie, and baby Jake can’t wait to go on a picnic! In the morning the family heads to their community garden, then to the farmer’s market and the grocery store to gather vegetables, fruit, meat, and other fresh and delicious foods. Readers follow them through the day as they go home to prepare, cook, and pack up the goodies, then cap their day by eating a yummy meal in the park and flying a kite together. Funny, accessible, family-filled illustrations; conversations between Gus and Nellie; and matter-of-fact text combine to show young children how food fuels our bodies — and help them see how healthy eating and drinking, and being active, can make them feel their best for a day full of fun. Gobble, Gobble, Tucker; Leslie McGirk (description) - Leslie McGuirk’s enthusiastic Tucker tries to be a patient little pup in this Thanksgiving story that is satisfying in every way. When Tucker smells a familiar scent in the air, he knows his favorite day of the year has come —Thanksgiving! 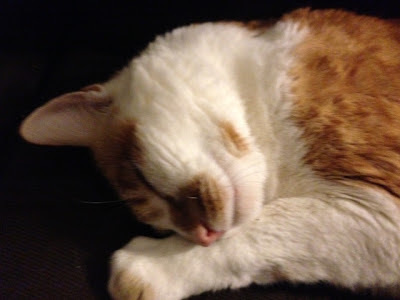 Tucker loves to play with his family, help clean up, and most of all, enjoy a delicious feast. But as the day goes by, Tucker and his doggy cousins haven’t had even a bite. Will they ever get to gobble up any holiday treats? Over the River and Through the Wood: The New England Boy's Song About Thanksgiving Day; L. Maria Child (description) - Matt Tavares's lavish illustrations illuminate this definitive edition of a beloved seasonal classic. 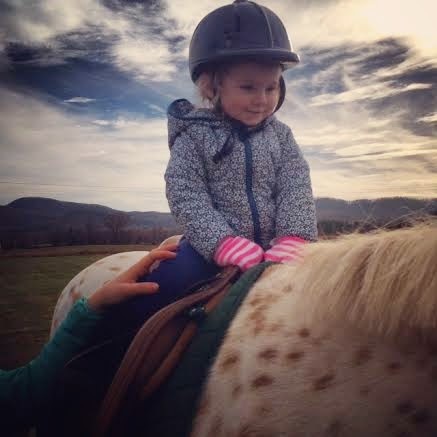 The horse is ready, the air is bracing, and everyone is bundled into the sleigh. So let the wind blow and the snow start to fall! This family is off to Grandfather's house for a delicious feast. Matt Tavares, with his keen eye for detail, fresh and surprising perspectives, and all the warmth and coziness of a big holiday dinner, illuminates the original text of Lydia Maria Child's verse about Thanksgiving Day, which has marked the start of the holiday season for generations of children. 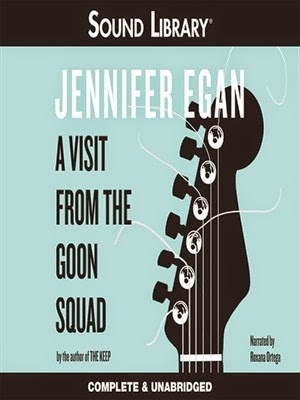 When A Visit From the Goon Squad was first released in 2010, I recall quite a bit of hype over this novel and the fact that the author, Jennifer Egan, was award the Pulitzer Prize for her work as well. I put it on my list and finally got to it . The story started out with promise. Sasha, a young woman in her mid-thirties, has had a troubled life. While she meets with her therapist at his office in NYC, we learn that the stealing is not because she needs or even wants something, it's just something she can't seem to resist. It has long been a problem for her. There is a somewhat funny incident in a rest room where she picks up a wallet a woman left on the counter and when she finds the woman frantic she gives the wallet back, begging her not to say anything. Sasha works for an aging record executive and former punk rocker at Sow Ear Records. Just when I was getting invested in Sasha's story, she pretty much disappears from the novel. Then all sorts of crazy characters, there must be 10-12 of them, begin to appear and disappear from the story. The story jumps from present to past and back again, and the points of view change as well. Their stories are mostly centered around rock and roll. The novel was just too disjointed for me for follow in audio format, and honestly, maybe I think I am just getting a bit too old for this type of story and writing. I doubt that I would have liked it even if I had read the print edition. Very disappointing. A debut, coming-of-age novel in which a teenage girl from Philadelphia leaves her old life behind to become The Sweetheart, one of America’s most infamous female wrestlers. It’s 1953 and seventeen-year-old Leonie Putzkammer is cartoonishly tall and curvaceous, destined to spend the rest of her life waiting tables and living with her widowed father, Franz, in their Philadelphia row house. Until the day legendary wrestling promoter Salvatore Costantini walks into the local diner and offers her the chance of a lifetime. Leonie sets off for Florida to train at Joe Pospisil’s School for Lady Grappling. There, she transforms into Gorgeous Gwen Davies, tag-team partner of legendary Screaming Mimi Hollander, and begins a romance with the soon-to-be Junior Heavyweight Champion Spider McGee. But when life as Gorgeous Gwen leaves her wanting, she orchestrates a move that will catapult her from heel to hero: she becomes The Sweetheart, a choice that attracts the fans she desires but complicates all of her relationships—with Franz, Joe, Spider, Mimi (who becomes her fiercest competitor), and even with herself. 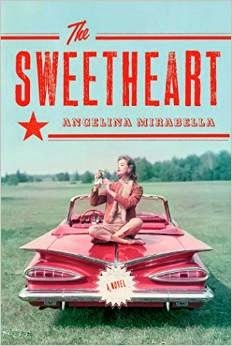 Angelina Mirabella’s surprising, affecting, and morally complex novel describes how a single decision can ripple through the lives of everyone around us. How Leonie sizes up the competition, how she triumphs, how she fails, and how she manages, somehow, to endure, holds promise: if she can, maybe we can, too. The Sweetheart showcases Mirabella’s breathtaking talent; it is daring, innovative, and powerful storytelling. 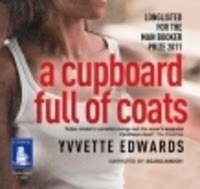 A Cupboard Full of Coats, a debut novel by Yvvette Edwards, was a very different and tough audiobook to listen to. In this story Jinx is a 30 year old woman who is still blaming herself for the murder of her mother by an abusive husband when Jinx was just 16 years old. Jinx now lives alone in London flat, separated from her husband and young son. She does not know how to engage with her young son and seems to lack mothering skills. These days Jinx is more comfortable working with the dead than with the living. Lemon is a former friend of both Jinx’s mother and Berris, the man who is now in jail for murder. The two men grew up on the streets in the West Indies. After a 14-year absence Lemon shows up without notice at Jinx’s door. His wife has died and he feels the need to come back and talk about why he too blames himself in part for the death . Jinx and Lemon reminisce about the past and also tell their painful versions of the time leading up to the murder as they recall it. Told mostly in the first person by Jinx, some of what she observed is upsetting and it explained a lot about why she is the way she is today. Lemon’s voice took some getting used to the Caribbean accent. I enjoyed listening to their stories, but I would have liked to learn more about Jinx’s earliest experiences with her own mother. 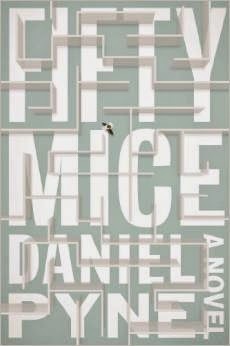 Clearly, none of the characters in this novel were sympathetic, except maybe for Red, the young son, who was missing out on a nurturing relationship with his own mother. The story alternates between the past and present and gives readers a good look at how children exposed to abusive relationships are affected long term. For Jinx, her mother changed completely when Berris came into the picture. Previously, things were peaceful for mother and daughter, but her mother felt lonely and missed having a man in her life after the death of her husband. Berris entered the picture and she became totally consumed by him at her daughter’s expense. A dark story with no real earth shattering surprise as the end, I enjoyed the story well enough, but the audio version, read by Adjoa Andon, was a tough one to listen to because of the dialect and the subject matter. Maybe it was three strikes, because not only was she an intellectual, she was a feminist. Which meant if she ever managed to finish this book, reviewers would inevitably dismiss it as "strident" and "shrill". 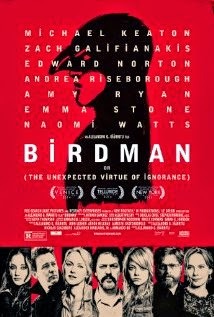 We were dying to see this movie as it got such rave reviews - 8.8/10 stars with its limited release. This weekend it made it to our cinemas, so we went to see it. The movie was very different -- Michael Keaton plays a washed-up superhero who tries to make one final comeback. The entire movie takes place on stage or in the dressing rooms basically. The acting was fantastic, but in the end we were a little disappointed. Should have gone to see St. Vincent. Have (2) weeks worth of new books on my shelves. Have you read any of these? Set in a small town in Ireland, it’s the late 1960’s and our title character, Nora Webster, 40, has just buried her husband. A widow with 4 children, 2 daughters who are living away from home, and 2 younger sons at home. Nora is depressed and grieving even though Maurice's death was no surprise. It came after a long illness. Before Nora had children, she worked as a bookkeeper at a local mill, but left the job to be a stay-at-home wife and mother. Now a widow, she finds herself needing to sell property and thinks about returning to work in order to support her family.Now she's been left with very little money and no job. So wrapped up in her own unhappiness, Nora doesn’t seem to notice how Maurice's death has affected her young sons. Donal has started stuttering and does not want to be in school where his father used to teach. She's is not a neglectful mother though, and when there is an issue at the school she steps in. She feels that her son has been treated unfairly, so she goes to the school and insists the situation be dealt with. Nora comes across as an unsympathetic character: cold, matter of fact and prickly, but she is also a strong and intelligent woman. As the story progresses Nora evolves. There is a scene where she cuts and dyes her hair, and then worries about how she will be judged by others given her fairly recent widow status. 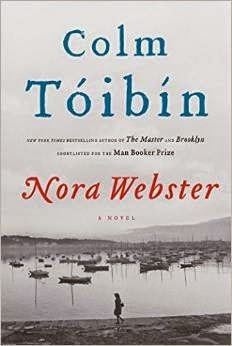 I enjoyed listening to Nora Webster, read by Fiona Shaw. The writing is pretty simple and not at all flowery, but the writing excels in that even basic details about daily life do not seem boring. Nora wasn’t a character I warmed up to, but I admired her ability to deal with her grief, grow as a woman and find a place in the world for herself as a widow. As always, Colm Toibin knows how to write about women. A very good story - try it. The Snow Child takes place somewhere around the 1920s, and tells the story of Jack and Mabel, a couple approaching 50 who moved to this Alaskan territory for a new way of life. Mabel is unable to have a child of their own after suffering a stillbirth back in Philadelphia. Feeling like they need a fresh start, they move to wilderness Alaska. Knowing that living in the wilderness will mean hard work, something which the couple is not afraid of, they are not prepared for the harsh weather and food scarcity they face in their new surroundings. Instead of the new area being a refreshing change of pace from their past in Philadelphia, life is rough and depressing. One day Jack and Mabel build a snow girl out of snow and decorate it with a warm red scarf. When morning comes the snow girl is gone but Jack finds child-sized footprints in the snow, and later, he sees a red fox and a young girl running through the snow. The girl is wearing the red scarf. Just who is this young child running through wilderness country in the freezing cold? For a good portion of the novel the only people who see the child are the couple. She comes and goes and seems to disappear for long periods when the snow melts. Her name is Faina. When Mabel mentions the girl to her friend and neighbor Esther Benson, the woman wonders whether Mabel had imagined the girl rather than actually having seen her. The story is based on a Russian fairy tale called The Snow Maiden, where a snow figure comes to life and draws her makers into its magical world. 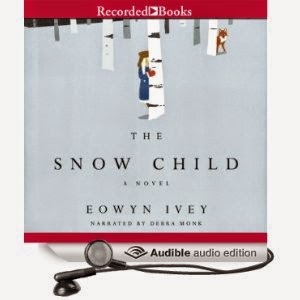 The Snow Child is a different kind of story about having hope when all seems lost. 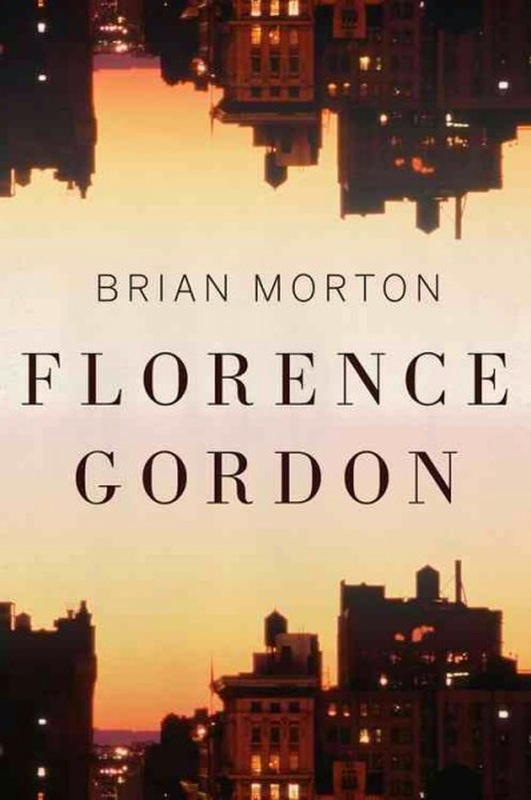 I don’t read a lot of books with magical realism, so I was surprised that I did enjoy listening to this novel, which was read by Debra Monk. I thought the writing was very descriptive, but felt the story itself a bit too long to sustain continuous interest (about 400 pp). I loved how Mabel and Jack’s relationship had its highs and lows and eventually seemed to blossom again over the 10+ year time span of the story. The Alaskan terrain is beautifully captured, but in the case of foraging for food, killing a moose and chickens, I was upset by the fact TMI was detailed. I suspect that animal lovers will be troubled by this aspect of the novel. If you haven’t read this one yet, it's a good choice for a chilly or wintery weekend. What if a man is placed in the Federal Witness Protection Program against his will? And doesn’t even know what he supposedly knows that merits a new name, a new identity, a new life? On the eve of major Maine snowstorm, Eric a small town lawyer is in the grocery store line behind a young woman who is shabbily dressed and appears homeless. Her hair is matted, she smells funny and she's also very thin. As she counts her money, she’s short of cash and begins taking items off the belt so Eric offers to make up the difference. Later after he’s left the store and is driving away, he sees the woman struggling to carry all of her plastic bags of groceries, so he stops to offer her a ride. She accepts and he sees that she has been staying in a cabin meant for summer use down by the river. He feels bad for her and helps her get some wood to start a fire, and then goes on his way while the snow falls fast and furious. When Eric gets to his car he sees that it has been towed along with his cellphone which he left inside. Not sure what to do, he returns to the cabin. Explains what has happened to the woman, who calls herself Danielle, and begs her to allow him to stay until the storm is over. She’s not too happy about it but allows him to stay. 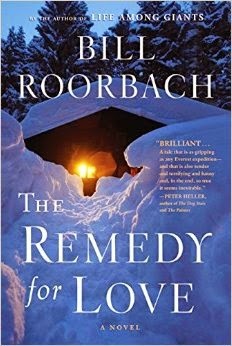 Described as “intensely moving and frequently funny, The Remedy for Love is a harrowing story about the truths we reveal when there is no time or space for artifice.” Unfortunately, I felt none of this as I read. Danielle and Eric are two characters who couldn’t be more different, and I can honestly say, I disliked each of them equally. Eric is still hung up on his wife who has left him and Danielle is possibly even more obsessed with her husband, Jimmy, who is serving in Afghanistan. As the snow falls and the couple spends time together their stories evolve. I loved the cover of this book and the overview sounded promising as well, but unfortunately I was disappointed. I felt the dialogue was rather boring, and, except for the setup, which was rolled out in the first few chapters, this was possibly one of the worst reading experiences for me in an awful long time. I know a few other bloggers really enjoyed this one, but I must say....sorry, I just can’t recommend this one. The Girl Who Fell From the Sky, is a coming of age story about a young (preteen) girl, who moves to Oregon to live with her black grandmother who she doesn’t really know. Rachel’s father is African-American and was stationed in Europe when he met Rachel’s mother, Nella, a while woman. Something has happened to Rachel's family and life as she knew it has forever changed. Prior to moving to Portland, Oregon in the 1980s, Rachel never thought about race, she was a bright girl who has lived in many different places since her father was in the the military. In Portland, race rears its ugly head almost immediately. Rachel is a pretty girl with beautiful blue eyes, and it is difficult for her to fit in at school and in her new environment. One of the black girls asks her, “what are you?” - something that she never really thought about before. She learns to act like the black girls so that she isn’t continuously picked on. As the story progresses the reader becomes aware of some sort of tragedy that took from the rooftop of a Chicago apartment building that took the life of the Rachel's mother, and her three siblings. The details of the incident are sketchy and Rachel’s father is not in the picture. The story is told from different points in time and different points of view, including revelations from Rachel’s mother’s diary. (Nella's struggles raising racially mixed children on her own.) Other characters who knew the family share what they knew about the family as well. Bit by bit the reader gets more information about the rooftop tragedy and the history which preceded the terrible event. 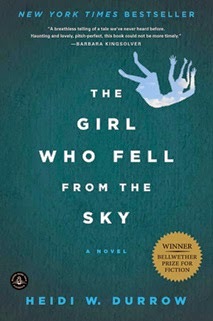 The Girl Who Fell From the Sky is a very good debut novel which was based on a true story. The focus of the story is more about Rachel and those who interact with her, rather than solving the mystery of the tragedy. I listened to this story mostly in audio format, and I found Rachel’s voice to be authentic and compelling. My heart went out to her for what she experienced, and I admired her strength while struggling to fit in and survive after losing the people she loved the most. "We found the woman floating face down in an eddy where Crooked River made a slow bend north, just a stone skip away from the best swimming hole this side of anywhere. Her emerald-green blouse was torn half open and her dark, pleated skirt was bunched around her waist, revealing skin puckered and gray, legs bloated and bruised. Her hair writhed like black snakes in the current. I poked her back with a stick. Not mean, but gentle, the way you might poke someone who's asleep. She skimmed the surface, bumped against a half-submerged rock, and returned to where Ollie and I stood at the water's edge. She bobbed there in the shallows in a tangle of brown leaves, her arms outstretched, fingers reaching, and it seemed like she was settling in to wait for someone else to come find her. Like maybe we weren't good enough, Ollie and me, just two girls with skinny arms and skinny legs who didn't know the first thing about death. We did, though. We knew more than we wanted to anyway."